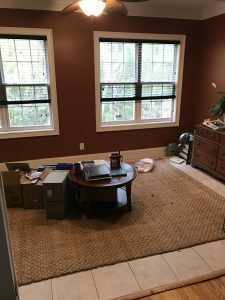 If you read my recent post about the beginning of our home office renovation, I mentioned that we shiplapped an ENTIRE room! You also know that I only wanted an accent wall, but it’s ok, I’m not bitter or anything. 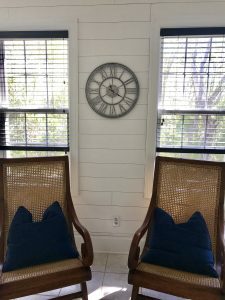 If you’ve read my other post about how we did shiplap, you’re probably wondering why I’m talking about it again, but this time we did things completely different! A wall of windows that is having a hard time bringing in light to this really dark space. 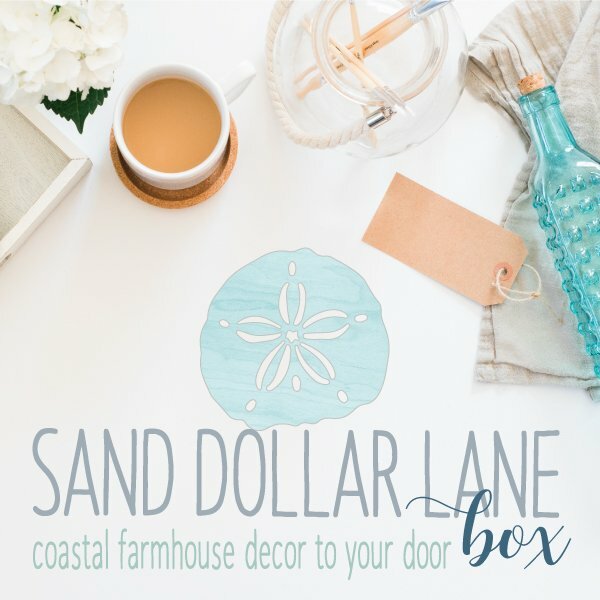 A little farmhouse, a little industrial, a little coastal. 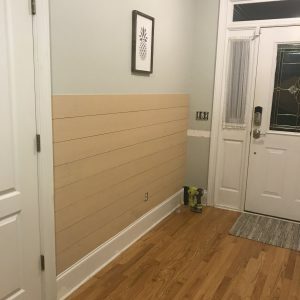 Our first shiplap project in the pantry we wanted full length boards and started at the bottom. 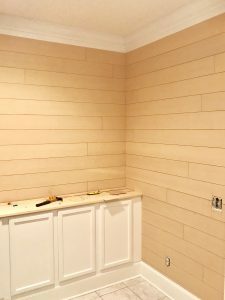 First couple rows of shiplap complete! We also didn’t just do one wall at a time, instead we went around the room and did every wall row by row. Round and round we went. Why, well we are still a little scarred by the foyer fiasco where the boards didn’t match up and I didn’t want to take that risk again. 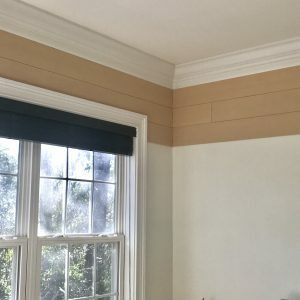 By going around the room instead of focusing on one wall at a time, we ensured that everything was level and the corners matched up perfectly. This project required 9 total plywood boards and we cut them all down with our Kreg Rip Cut Jig and Ryobi Circular Saw. Like I’ve said before, the jig was amazing to guarantee that every board was the same 6 inch width every time. 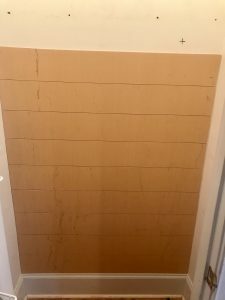 We cut the boards down the long side of the plywood to cover as much space as possible, but also paying attention to stagger the boards so it didn’t look too uniform around the room. Slowly but surely making our way around the room. First two shiplapped walls completed! There is no better feeling than when you put the last nail in the wall. To keep with a more authentic and rustic look, we made the gap in between the boards using the same spacing with nickels like we use to space the boards when we add another row. It took extra hands and more nickels to hold everything in place while we were nailing. 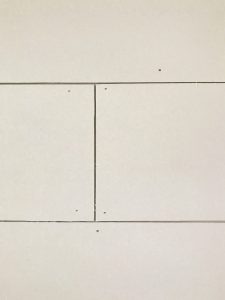 Oh and I also asked YOU what we should do about all the nail holes and overwhelmingly y’all agreed, we should leave them. (Which I could hug you all for agreeing with me because after putting in well over 1000 nail holes I was not feeling the urge to wood fill all. those. holes.) At first the hubby wasn’t on board, but when I showed him the results of the poll, he agreed. Granted I had to show him multiple times and I would make comments like “oh look one more person agrees with me.” Guess what, we both love it! 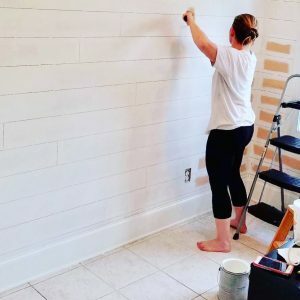 The most satisfying part of the project, painting the shiplap and breathing new life into this space. 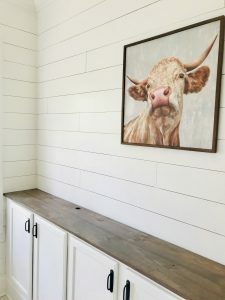 I should also mention that we did the built in cabinets first before we did the shiplap. 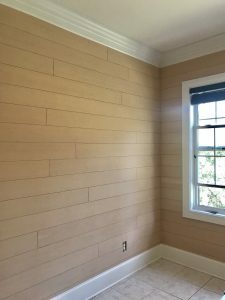 No point in putting shiplap where no one would see it. This leads to the next topic… Are you ready to hear how we did the built in cabinets? Stay tuned! 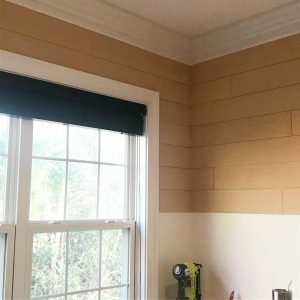 Here’s a teaser picture and a shot of some of the finished shiplap. I am so ready to have my office back because I’m head over heels in love with this space! Round 3 – you’ve been super busy and it has paid off. Everything looks gorgeous. 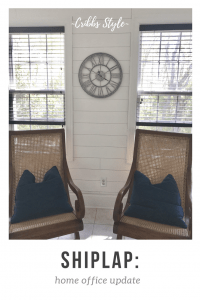 I love, love, love, country farmhouse style – can’t get enough of it. Can’t wait to see more of your projects! Thank you so much Julie!! It has been a lot of work, but a lot of fun at the same time! Can’t wait to get in there and actually work! !